Dye DSR Paintball Guns There are 6 products. The DSR is not just raw performance and muscle. True to DYE’s design theory, the DSR’s ergonomic comfort is second to none with features including the UL Frame hourglass design and dual density full wrap Sticky Grips with precisely layered micro-texture that provide ultimate comfort. The updated TruCam Airport, Edge1 trigger, and new Core DYE Barrel give you total control over the powerful new DSR. DYE’s craftsmanship is unmistakable in the DSR from the endless performance features to the crisp strong lines that race uninterrupted across the low profile DSR body with no bulky plates or exposed screws. The DSR is a sleek, compact, and efficient machine built to outperform and outlast the competition. ARC Bolt - The all-new ARC Bolt is DYE’s groundbreaking new engine that delivers amazing performance in a robust, reliable package. The ARC Bolt’s smooth, quiet shot, high efficiency, and soft touch on paint is the end result of precise engineering. Optimized flow paths, dwell independent valve control, air supply cut off, and nearly zero shot chamber expansion are all critical to the ARC’s air efficiency. 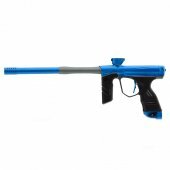 Two stage bolt acceleration, air spring, impact bumpers, and an ultra-low 115 psi operating pressure ensure a smooth, quiet, and accurate shot that is extremely gentle on paint. Quick Release Bolt - The all-new Quick Release Bolt Assembly is a robust gate system with air lock that prevents accidental bolt release and securely holds the bolt in place. A simple push button system allows the user to remove and re-install the bolt kit in seconds. Standard maintenance has never been easier or more accessible. MOS - Method Operating System - The DSR is powered by DYE’s Method Operating System. The MOS gives the operator unrestricted access to precision tuning and unsurpassed performance. The optimized MOS programming logic ensures lightning fast response time, long battery life, precision tuning, and dual player profiles to store your exact playing specifications. Communication between frame and body is facilitated through the Freewire Connector Pins. Compression pins ensure a positive connection between performance driving hardware and the MOS. DYE Freewire Connector Pins eliminate awkward wire routing and dramatically improve serviceability. The MOS is truly advanced performance in the palm of your hand. Control Joystick - The 5-way Control Joystick and high contrast OLED display screen provide an intuitive user interface. Eye Pipe Breech System - DYE’s Patented 3rd Generation Eye Pipe Breech System shields the anti-chop eye system from any dirt and broken paint. The thick, durable polycarbonate pipe is wiped clean by the bolt tip o-ring on every firing cycle creating a self-cleaning system that ensures the eyes are always monitoring the breech and ball drop. DYE’s proprietary Eye Pipe system protects your DSR from harsh environments and eliminates performance-hindering breech wear. The extended-life Leaf Spring Ball Detents are integrated into the Eye Pipe to prevent double feeds and chopped paint as well as eliminating the need for bulky exterior eye plates. UltraLite 45 Frame - The UL 45 Frame is the culmination of top pro-player influence and progressive engineering. Designed specifically for modern double finger triggers, the UL Frame’s hourglass shape was ergonomically designed to give the player ultimate control, comfort, and performance. The UL Frame combined with DYE’S famous Sticky Grips offer a secure grip for stability and accuracy while encouraging sustainable, rapid trigger speed. Edge1 Trigger - The Edge1 Trigger is a blade-style trigger with adjustable travel, activation, and resistance. Allowing optimal tuning for unbeatable speed, reaction time, and ultimate trigger control. Patented DYE Sticky Grips - The full wraparound Sticky Grip with micro-texture provides the ultimate grip. Dual density design offers comfort and control. The single screw design utilizes a durable locking system to ensure a rock solid grip and quick access for service. Lockdown Clamping Feedneck - The adjustable cam lock lever allows you to securely lock your R-2 Loader onto your gun without tools. DYE’s Lockdown Feedneck sits low and tight on the marker making sure your R-2 keeps a low profile. Color Coded O-Rings – Pioneered by DYE Precision and designed to make it easy to quickly identify the correct replacement o-ring when performing maintenance on the DSR. Quick Battery Access - Battery access made extremely simple. Simply use the quick-turn recessed lock nut and slide the dual-density grip with micro-texture off for easy battery access. Freewire Connector - No wires between the frame and body with quick disconnect contact pads. Eliminates awkward wire routing and dramatically improves serviceability. New protected connection helps prevent water intrusion. Low Profile Design - All-aluminum body construction with no exposed screws or eye plates. UL TruCam Airport - The UL TruCam Airport is a balanced cam system with an easy turn on/off toggle lever featuring a single o-ring design. The recessed lever design ensures extra protection from accidental degassing of the system. The sleek, compact airport is integrated with the Hyper 6 Regulator into a simplified easy-to-service air handling cartridge that provides extremely efficient air flow. Core Barrel - The new Core 14’’ two-piece barrel comes with DYE’s proven vent hole pattern in the trademarked Steady Port Tip. The Core control back is finished under the most extreme tolerance specifications. Self-aligning two piece construction ensures properly centered assembly between control bore and the Steady Port Tip. This combination of precision components provides a quiet shot, superior accuracy, and unbeatable performance. H6 Regulator - The Hyper 6, now with a more efficient airflow path and consistent piston movement. The latest generation of DYE’s trusted line of regulators is the most reliable and consistent regulator DYE has produced to date. Updated with a single coil spring and top load assembly that allows for exceptionally easy service. Integrated into the Hyper 6 is a pressure bleed-off to ensure no air is trapped in the marker when degassed. Improvements focused on performance, reliability, and safety to ensure the best playing experience possible. Hard Foam Case - Features an EVA foam lining for secure protection of the DSR. Slick Lube, quick start guide, DYE Core allen key set, and barrel sock are included with the marker.